The most important source for Bach's Cello Suites is a copy made by his wife Anna Magdalena because the autograph is no longer extant. As further copies show, the actual musical text is scarcely problematic. However, the slurs, which are particularly important for string instruments, are very inexact and compel the editor to make difficult decisions. Our practical edition, HN 666, is in two parts. It not only offers the Urtext edition - with preface and critical commentary - but also a part for playing. The new study edition contains the Urtext part, but in addition offers a reproduction of Anna Magdalena's copy. This means that both cellists and music lovers alike are able to form their own opinion about the much discussed problems. 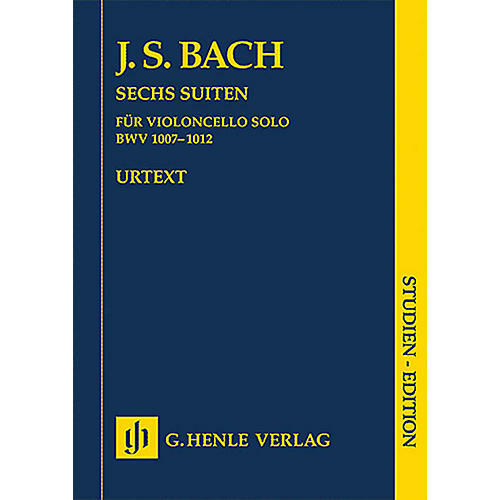 Contents: Suite G Major BWV 1007 · Suite D minor BWV 1008 · Suite C Major BWV 1009 · Suite E flat Major BWV 1010 · Suite (Skordatur) C minor BWV 1011 · Suite D Major BWV 1012 · Appendix: 5th Suite in pitch notation c minor BWV 1011.